A luminous portrait of life in the Middle East, Day of Honey weaves history, cuisine, and firsthand reporting into a fearless, intimate exploration of everyday survival. In the fall of 2003, Annia Ciezadlo spent her honeymoon in Baghdad. Over the next six years, while living in Baghdad and Beirut, she broke bread with Shiites and Sunnis, warlords and refugees, matriarchs and mullahs. Day of Honey is her memoir of the hunger for food and friendship—a communion that feeds the soul as much as the body in times of war. Reporting from occupied Baghdad, Ciezadlo longs for normal married life. She finds it in Beirut, her husband’s hometown, a city slowly recovering from years of civil war. But just as the young couple settles into a new home, the bloodshed they escaped in Iraq spreads to Lebanon and reawakens the terrible specter of sectarian violence. In lucid, fiercely intelligent prose, Ciezadlo uses food and the rituals of eating to illuminate a vibrant Middle East that most Americans never see. We get to know people like Roaa, a determined young Kurdish woman who dreams of exploring the world, only to see her life under occupation become confined to the kitchen; Abu Rifaat, a Baghdad book lover who spends his days eavesdropping in the ancient city’s legendary cafés; Salama al-Khafaji, a soft-spoken dentist who eludes assassins to become Iraq’s most popular female politician; and Umm Hassane, Ciezadlo’s sardonic Lebanese mother-in-law, who teaches her to cook rare family recipes—which are included in a mouthwatering appendix of Middle Eastern comfort food. As bombs destroy her new family’s ancestral home and militias invade her Beirut neighborhood, Ciezadlo illuminates the human cost of war with an extraordinary ability to anchor the rhythms of daily life in a larger political and historical context. From forbidden Baghdad book clubs to the oldest recipes in the world, Ciezadlo takes us inside the Middle East at a historic moment when hope and fear collide. Day of Honey is a brave and compassionate portrait of civilian life during wartime—a moving testament to the power of love and generosity to transcend the misery of war. Born in Chicago, Annia Ciezadlo grew up in Bloomington, Indiana. She received her Master's in journalism from New York University in 2000. In late 2003, she left New York for Baghdad, where she worked as a stringer for The Christian Science Monitor and other publications for the next year. During this time, she wrote groundbreaking stories, about parliamentary quotas for women, Baghdad's graffiti wars, militant Islamist poetry slams, the flight of the country's Christian minority, and Iraq's first reality tv show. Her first-person piece on what it's like to go through checkpoints in Baghdad earned a flood of responses, and is now used by the US military to help prevent civilian casualities. Since then, she has reported on revolutions in Lebanon, crackdowns in Syria, repression in Iraqi Kurdistan, and the 2006 "summer war" between Israel and Hezbollah. Although she has covered several wars, Annia does not describe herself as a war correspondent. She specializes in articles about Arab culture and civil society, stories that explore the intersections between larger political realities and everyday activities like driving, cooking, and going to school. She has written about culture, politics, and the Middle East for The New Republic, The Nation, The Washington Post, the National Journal, The Christian Science Monitor, The New York Observer, and Lebanon's Daily Star newspaper. 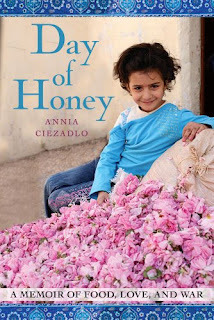 Annia lives somewhere between New York and Beirut, with her husband, the journalist Mohamad Bazzi. This is a wonderful book about love, war and food that will have you craving the dishes mentioned. Of course, the author is kind enough to provide some recipes along with her witty take on life. I found myself laughing (inappropriately) at her descriptions of how marriages are arranged in the Middle East. There are a lot of little insights into this little understood place with first person accounts make the area a lot more real than what you see on the news. It is a blessing that Ciezadlo is a journalist since she brings a natural balanced view to the war torn areas of Beirut and Baghdad. She really made the people accessible though their customs and food. I don't recommend reading this book if you are hungry, since the description will have you craving the food. I received this book at no cost from the publisher in exchange for my honest review. Sounds like a nicer view of the area than what we always see on the news. Brings a human face to the people she met. Thanks for bringing my attention to this book. It sounds so goo, I added it to my TBR. Glad to know you how much you liked it. I also read a very interesting review of it in the New York Times, last week.